So what is PADI eLearning in a nutshell? 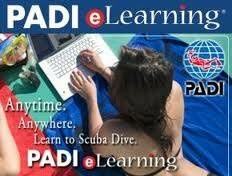 PADI eLearning lets you complete the knowledge development sections of selected PADI courses online. Traditionally this section was completed in the classroom of the PADI Dive Shop before your course. With PADI eLearning you can complete these sections as long as you are online. If this sounds like the option for you, visit www.padi.com/elearning or contact your local PADI Dive Shop and they will be happy to help you!